A pastry shell filled with hazelnut with a soft and perfumed with hazelnut and always cover with a hazelnut chocolate ganache .... Need I say more or gorgeous enough description?? I think it's clear to everyone that this cake giffonese the legendary Sal de Riso conquered me! The idea of this cake was created by industrial quantities of chocolate eggs for disposal including a gianduja that fits perfectly with this cake (one of the flagships of the legendary pastry chef) and a whole lot of nuts Giffonesi doc. Maybe with the spring many abandon the chocolate cakes for dessert more cool but how do you say no to a cake like that? It would be a crime: D!! 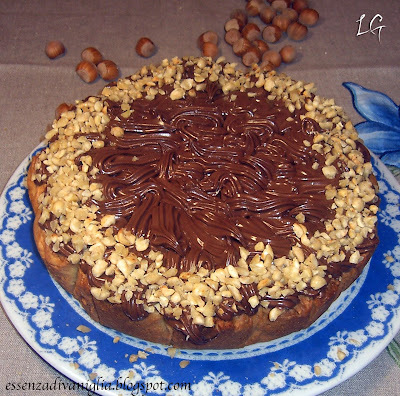 Cake Giffonese (Sal de Riso) For the pastry with hazelnuts 400 g flour 00 g butter 240 Molino Rossetto soft Inalp 160 g icing sugar 100 g hazelnuts 50 g egg Giffoni 4 g of baking powder for cakes 1 vanilla pod For the stuffing with hazelnuts Inalp 150 g soft butter 150 g sugar 150 g egg (n.
3) 150 g of hazelnuts Giffoni powder 2 g salt a half orange zest to the cream with chocolate and hazelnut chocolate hazelnut 250 g 80 g of fresh cream 30 g butter 30 g of pure hazelnut paste for finishing roasted hazelnuts with electric whips work the butter and sugar until light and creamy cream, hazelnuts embedded in powder (or finely chopped) and then add 1'uovo, 1'albume, baking powder, salt and vanilla seeds. Mix with a spatula and then gradually add the sifted flour. 1'impasto worked briefly with your hands, form a ball, wrap in plastic wrap and let rest in refrigerator for several hours. Prepare the stuffing with hazelnuts. In a large bowl mounted slightly softened butter with the sugar, salt and orange zest. Incorporate the eggs one at a time and then the nuts powder. For the chocolate and hazelnut cream, melt in water bath in a thick-bottomed pan over the chocolate hazelnut reduced to pieces. Separately, boil the cream for 30 seconds and then pour over chocolate creamy smooth and shiny. United eventually softened butter and hazelnut paste. Emulsified well and leave to cool and stabilize for at least 12 hours. Now, in a tin of 22 cm in diameter, roll out the pastry about 5 mm thick. Stuffed with hazelnut filling up to three quarters of Giffoni Bake in oven at 170 ° C for about 35 minutes. Once cooled, the cake on a deformed plate and a sac-a-few rich form with a nozzle on the surface of the waves with the creamy chocolate and hazelnut. Sprinkle on the edge of the grains of toasted hazelnuts. .
Picture Window theme. Theme images by YinYang. Powered by Blogger.